Not all businesses are born equal. We can categorize them based on several characteristics and based on the level of granularity we can find more or fewer differences. A solo business isn’t as complex as a ten-person business, which in turn isn’t as complex as a hundred person business. And the matter is complexity isn’t a simple game. It works on exponential grounds. A group of ten people isn’t the same creature compared to a group of a hundred people. In short, in business, we have a problem with scaling, due to the dynamics of complex systems. Therefore, the system that I’m using here tries to reduce complexity by trying to find the essence of any business, which by per se is a herculean task. That essence might be useful for several reasons. 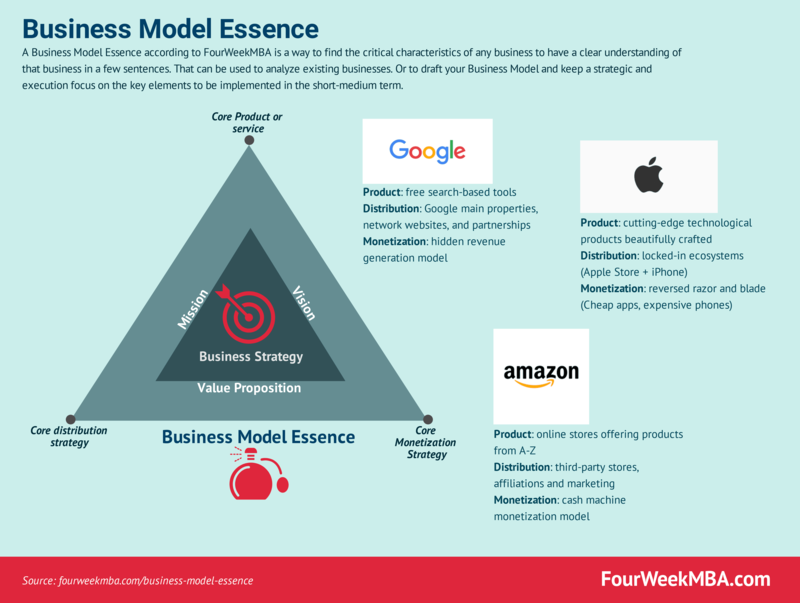 For instance, as FourWeekMBA is followed by business students, professors, executives and entrepreneurs, each of those people will use a business model essence with a different aim in mind. At the core, a business model essence wants to be a snapshot, yet it is essential not to take it too seriously otherwise the risk is to make it become a cartoon. A student or a professor of business will use it to summarize what she thinks a business is made of. An entrepreneur might use it to focus on how to grow its own business or how to compete with existing organizations in a specific industry. Business models and their essence are made of assumptions. Assumptions need to be tested in the real world. And this is the whole point of business strategy. I use the term “core” as many companies (especially large ones) have a business model that is made of many products or services, delivered through several distribution channels, and where each of those might have a separate monetization strategy. For the matter of finding the essence, we’ll look at the core product/service, distribution channel, and monetization strategy as this is a good starting point to have a snapshot of a company. Once we have figured the essence of that company, we can understand what’s next and how the resources that are getting unlocked by their main products, distribution channels, and monetizations strategies are getting used to creating new ones! In the infographic that accompanies this article you can see three key examples and how we can extract their essence.